I’ve been sick the past couple days, something very unusual for me. So we’re revisiting a piece we published long ago. Have you ever been completely captivated by a beautiful setting—maybe a golden sunset on a mountain, freshly scented air after a soft summer rain, or moonlight over the sea? One Sunday morning John awakened just before dawn. The nearly full moon was hovering over the rugged mountains to the west. On the eastern horizon the sun, an orange-gold globe, was peeping over the foothills, bathing the summits of the western mountains in an otherworldly glow. Puffy white clouds raced across the deep blue sky, pushed by a warm wind blowing out of the west. 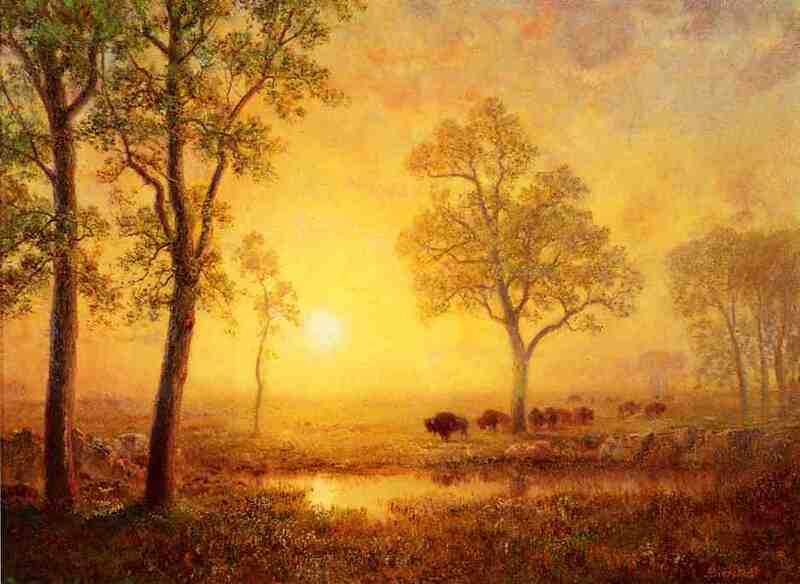 Suddenly the whole valley around him was alive with a golden-amber light. Everything was glowing, transformed as if he’d moved into another dimension. He stood there amazed at how much beauty there is in your world! You don’t even have to look for it. It’s all around you. No matter where you live—in the city, at the seashore, or in the mountains. If you will but look for that beauty all around you, knowing in your heart it is there, you will find your life becoming more joyful and peaceful. Look for the beauty everywhere—in the obvious places, as in the sunrise, the sunset, the mountains, the sea. But also get used to looking for it in unexpected places. Look for it everywhere. One of the best ways to become more aware of your planet’s beauty is to take a walk out in nature. Even if you live in a city, find some trees, flowers, or grass—anything alive and growing. Study its beauty, feel its energy. You will be uplifted and inspired. Your worries will vanish and you will know all is right with you and your world. You will feel that deep sense of beauty, joy, and power you can find only in the present moment. In this short video, Eckhart Tolle, author of the best-selling book, The Power of Now, talks about what it means to be present in your own life. Are you fully present in your own life? How can you increase your present-moment awareness? Please share your thoughts and comments with us below. John Cali is a writer, blogger, and channel for a group of spirit guides. His next book is Conversations With Spirit: Real Answers to Life’s Pesky Questions, Book 1. John lives in northwestern Wyoming.Sign up for his newsletter here. Hope you are feeling lots better today John. Thanks for sending us this. I didn’t see it from before and always good to be reminded to be in the moment. Video really helpful, especially about enjoying the simple movements we need to make doing regular chores. Children taught me how to enjoy washing up! It’s water play to them …never a chore! Thanks Susan for sharing your video too. Wow….amazing filming…..great to see the world through the eyes of fox cub. What love expressed in mother fox’s eye. Great how the film showed the inter-connection of all life. I have just been reading lots about communicating with animals and flowers et al and finding life so much richer and deffo helps connect to the moment. Thank you John for your site. It has made a huge impact for good in my life. Thank you very much, Margaret — I’m fully recovered. I still remember how much fun it was simply washing my hands as a kid — as you said, it’s just water play to children. I’m delighted, Margaret, our site has made a difference in your life. Thank you for letting me know that. Great video, Susan! Thank you. Thanks! I was very upset at the Hobby Lobby issue yesterday. Still am, but this beautiful article makes me feel better. You’re most welcome, Patricia — glad it helped. I hope you’re feeling much better very soon, John. 3-4 years ago I was told that taking 50 mg of chelated zinc daily would prevent contracting a cold or the flu. It’s been my experience that nothing works for every one, but that has worked very well for me.